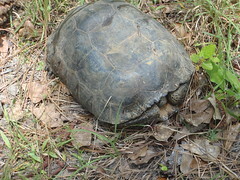 The gopher tortoise (Gopherus polyphemus) is named for its burrowing skills. 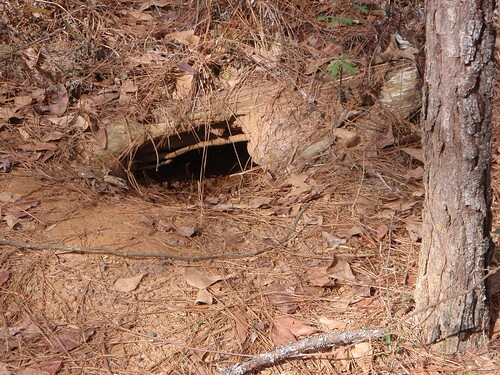 Its shovel-shaped forefeet dig burrows up to 40 feet long that shelter and house not only tortoises, but a virtual zoo. By one count, an astonishing 362 animals take refuge in these burrows, from gopher frogs and burrowing owls to an array of snakes and invertebrates, some species depend entirely on them. If we lacked the scientific concept of a keystone species--one with an impact far beyond that expected from its numbers--we'd need to create it for the gopher tortoise, given its importance in the longleaf forest ecosystem.